My favorite antique mall was having their big spring sale last weekend, and I found the coolest old hanging scale. I thought it would be a fun addition to the kitchen, especially since I'm a sucker for wire baskets. 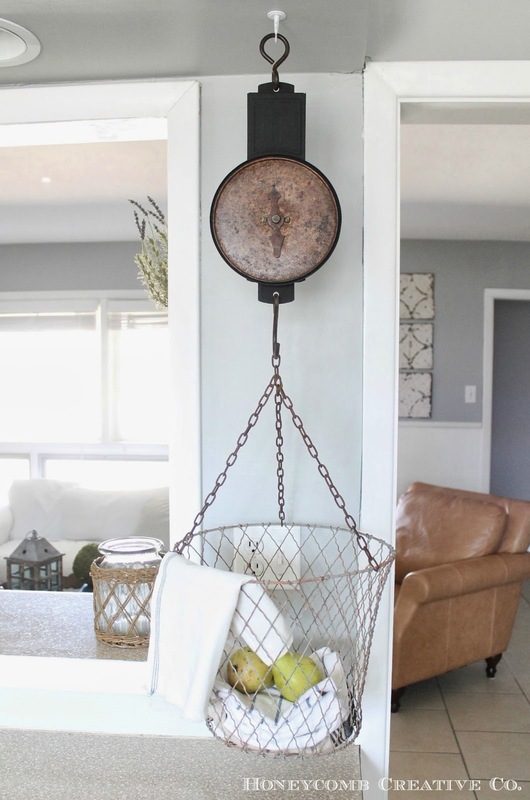 I had seen hanging scales with other kinds of bowls and plates hanging from them, but I'd never seen one with a basket. I'd be curious to know what its use was. 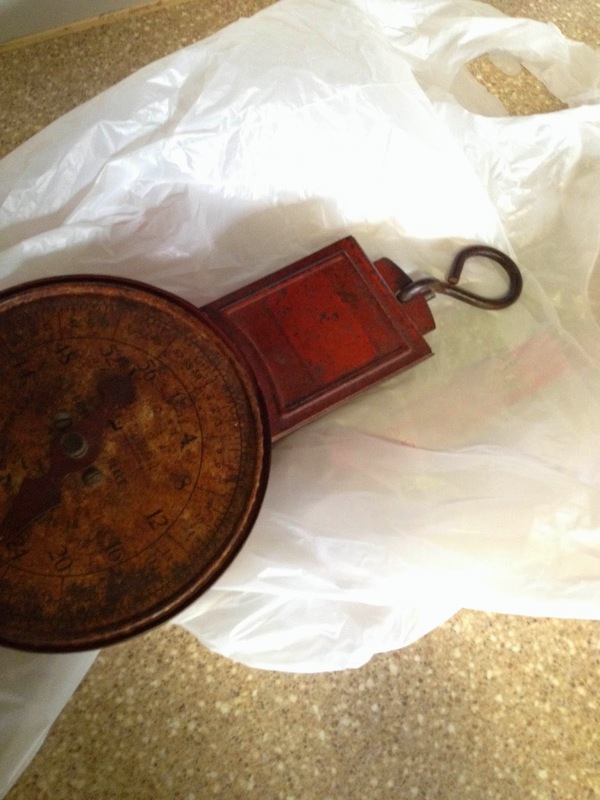 Some sort of grocery scale? When I purchased it, it was red and rusty. The patina was great, but I don't use much red in my decor. You might want to look away if you can't stomach painting over a great patina (I even feel a little guilty...) but I knew black would go much better in our kitchen. Here's a lovely iPhone shot of the scale before I painted it. Much better! I just used simple black craft paint. 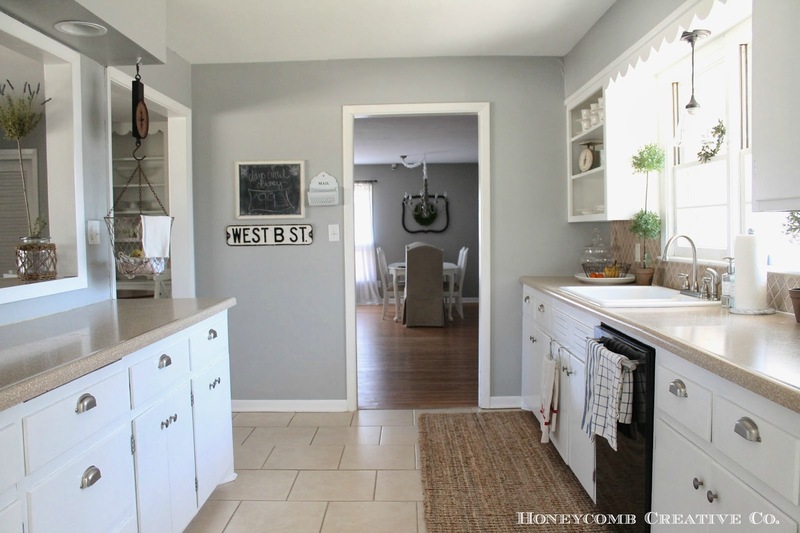 I think it adds a lot of interest to the long open space that opens onto the hearth room. Don't mind the pine wreath on the window...it's coming down soon! 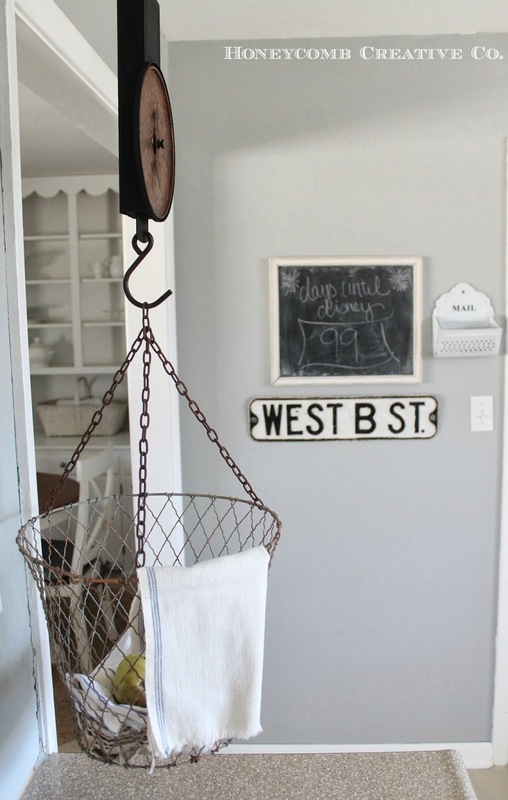 Love the patina on the wire basket. 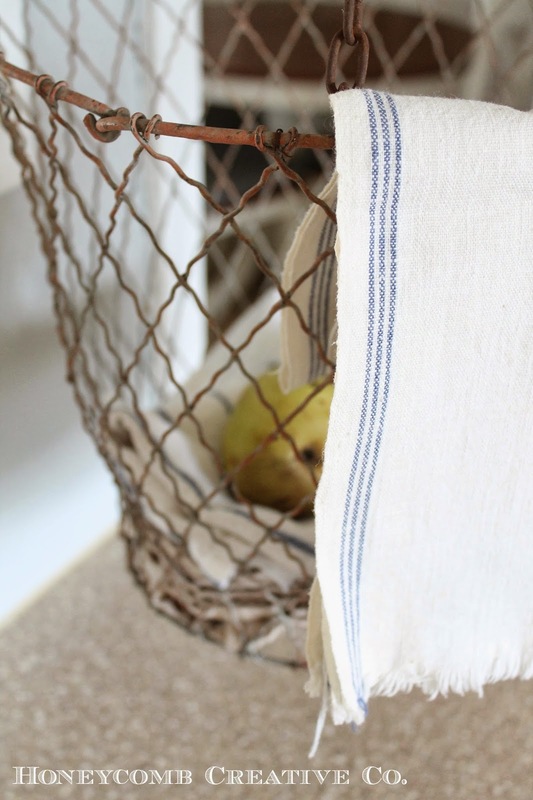 I also found the striped tea towel this weekend - I never find the ones with blue stripes! It was the perfect addition to the scale. It looks right at home, don't you think? When we bought our house, we needed a lot of furniture. A LOT of furniture. We were going from 800 square feet to 2,400 square feet, which included three separate living spaces, two dining spaces and four bedrooms. That's a big jump! And, as with most of us, our budget was not unlimited. So what's a girl with high-end taste and a realistic budget to do? Bargain hunt, of course! 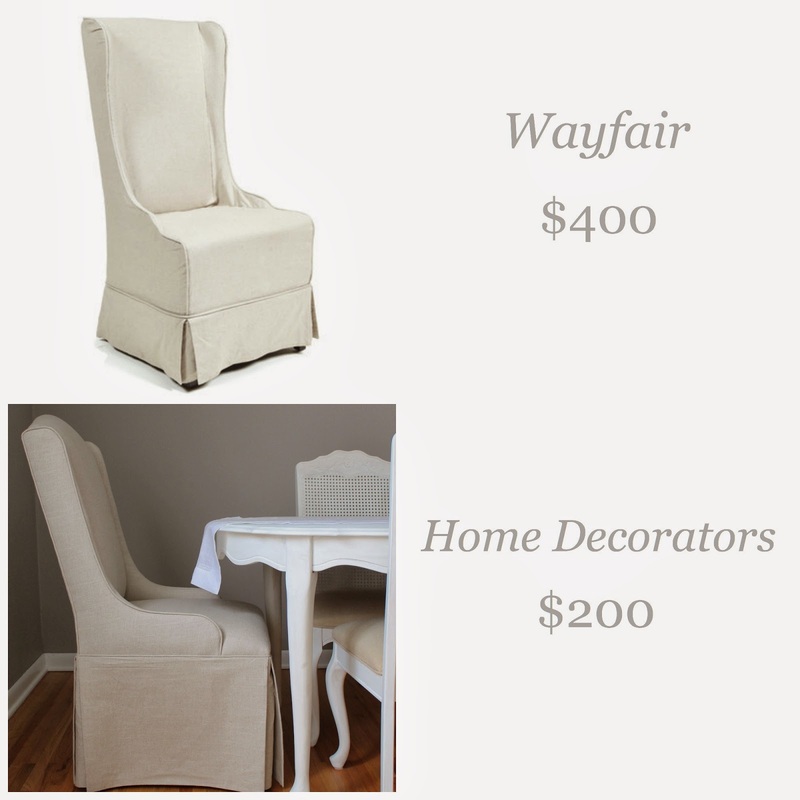 Today I want to share some of my top tricks for finding elegant home furnishings on a budget, including what we scored for our own house. 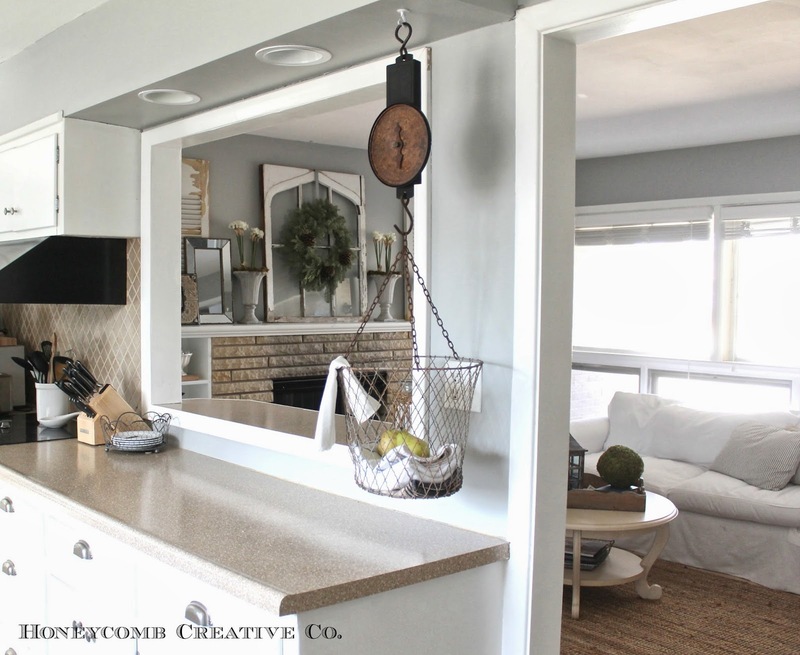 When I thought of the home I wanted to create, I knew the look I was going for. I used Pinterest, catalogs and magazines to jumpstart my creativity and work out the look I wanted in my head. So when we needed a sofa, I already knew just what I wanted. The Willow sofa by Crate and Barrel. This thing is gorgeous. And...it's $1,900. Wasn't gonna happen. 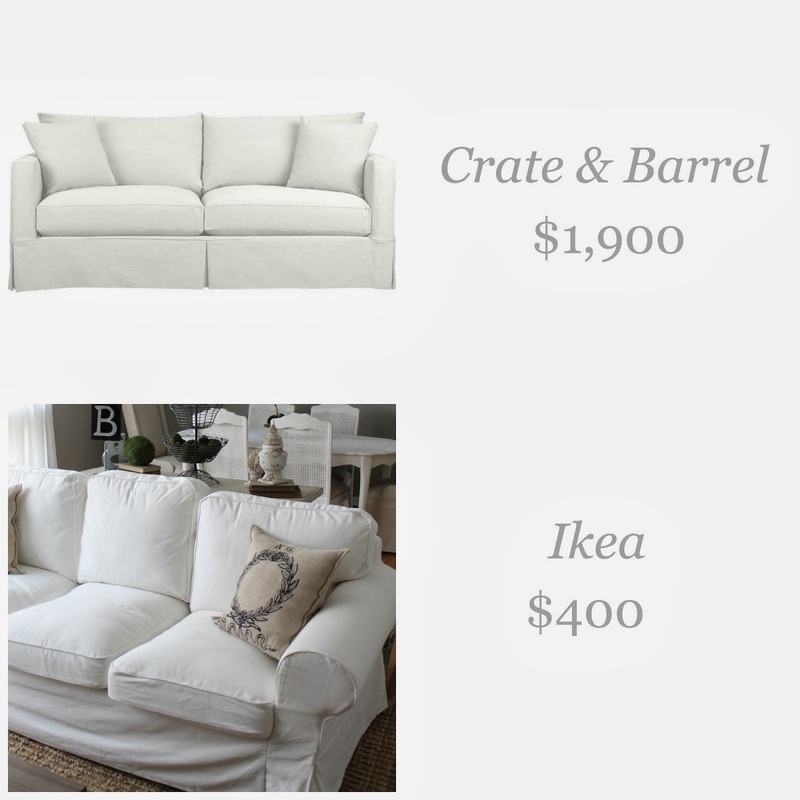 So what's a girl who wants a comfy white slipcovered couch to do? Head to Ikea of course, which saved me $1,500. We LOVE our Ektorp and I am continually impressed with the quality. Same look for a fraction of the price. One of my favorite features of our house is the original hardwood floors. But hardwoods definitely need some softening, and rugs can be expensive. Neutral rugs like sisal and jute can kill your budget in a hurry. By far my favorite affordable rug source is overstock.com. I found our 9x12 jute rug there for $360. 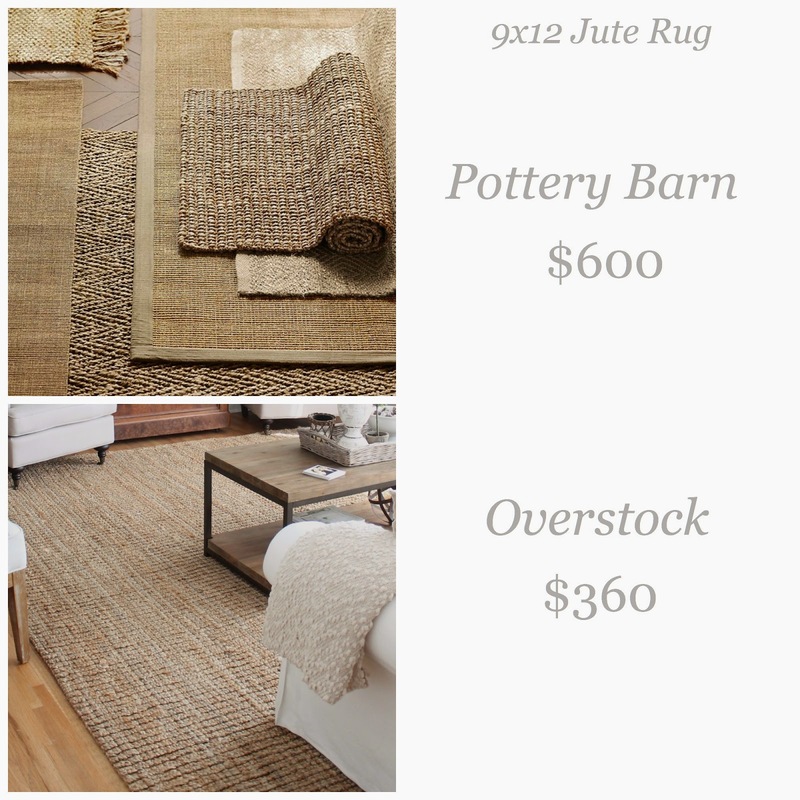 I also like Joss and Main for rugs, though honestly Overstock usually has the same ones for even less. Leather furniture is one of the best ways to add a high-end look to a space. 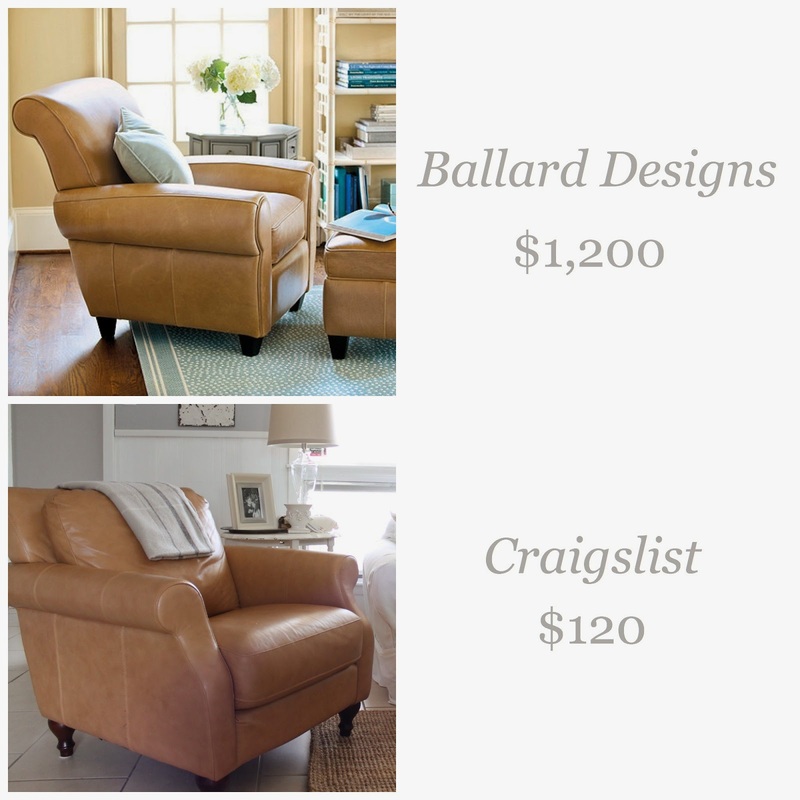 I had been drooling over the cognac leather arm chairs at Pottery Barn and Ballard. I scoured Craigslist for weeks and finally scored an almost identical chair for $120. It just shows it pays to be patient and persistent when it comes to Craigslist. You never know what might turn up! I loved that our house had a bar off the kitchen, but I wasn't really prepared to drop several hundred dollars on bar stools. I knew I wanted to incorporate kubu wicker throughout our home, and fell in love with these kubu stools when I saw them at Pier 1. 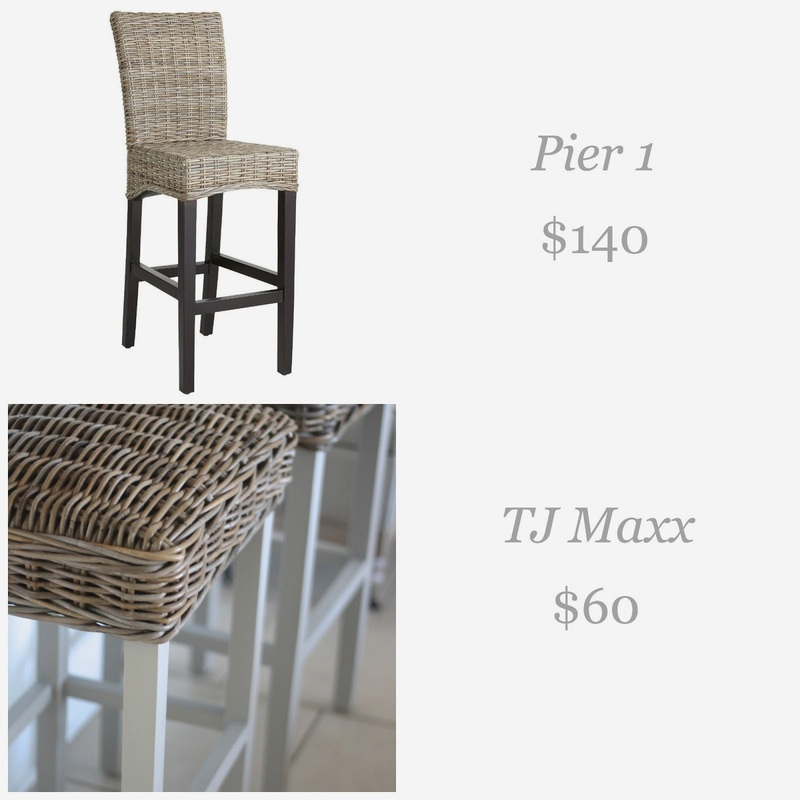 But a few weeks later, I walked into TJ Maxx and there were kubu bar stools for less than half the cost - just $60 each. They didn't have backs on them like the stools from TJ Maxx, but that was a compromise I was willing to make for the look and the price. 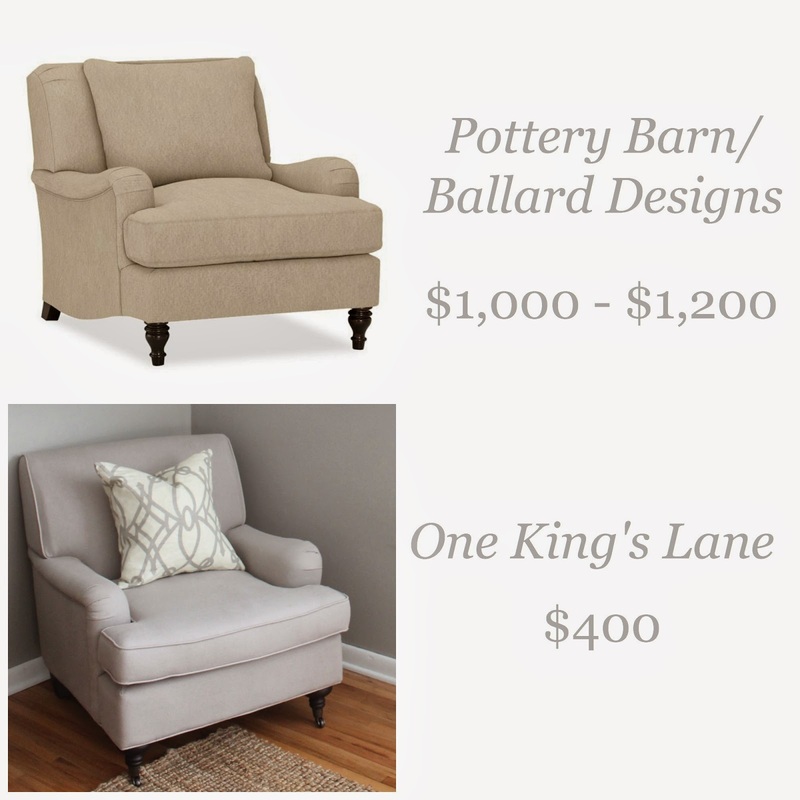 One King's Lane and Joss and Main are two of my very favorite home decor sources. They hold daily sales that last for just a few days, and you can score furniture and accessories for a fraction of what they go for elsewhere. Not every item is significantly less than other retailers, but most are discounted and some are huge steals. 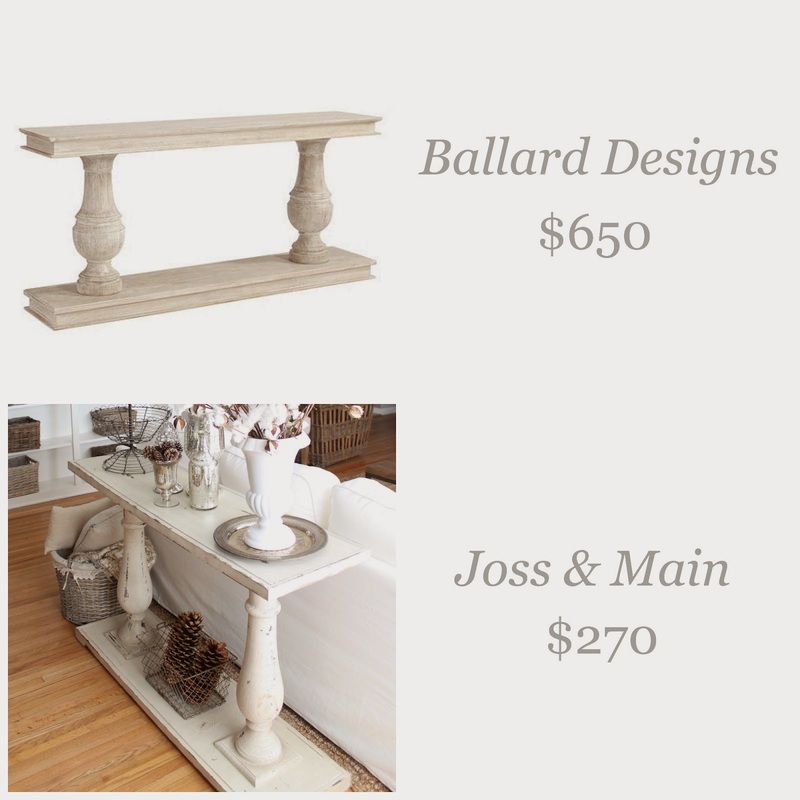 Both our club chairs and our console table were less than half the cost of other retailers from Joss and Main and One King's Lane. Can't beat that! 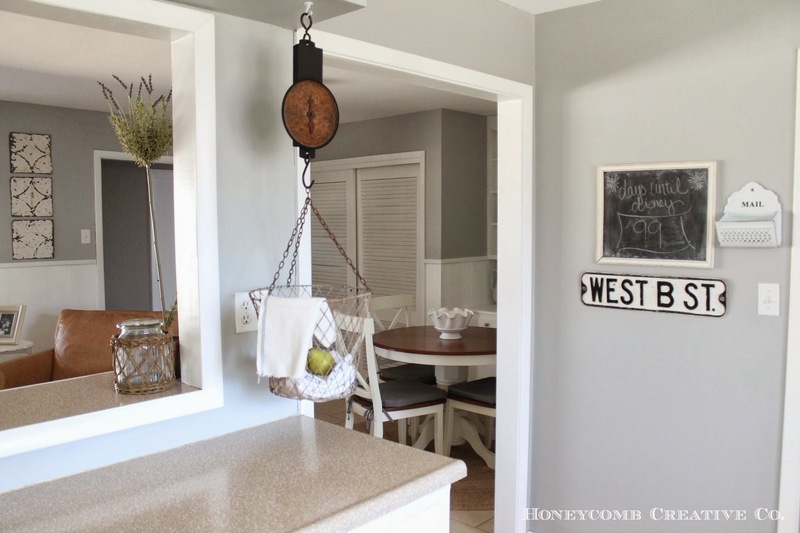 Have you priced light fixtures lately? I think lighting is the most over-priced aspect of home furnishings I've come across. Again, I knew the look I wanted - very Pottery Barn meets Restoration Hardware - so I scoured alternative sources for similar finds. 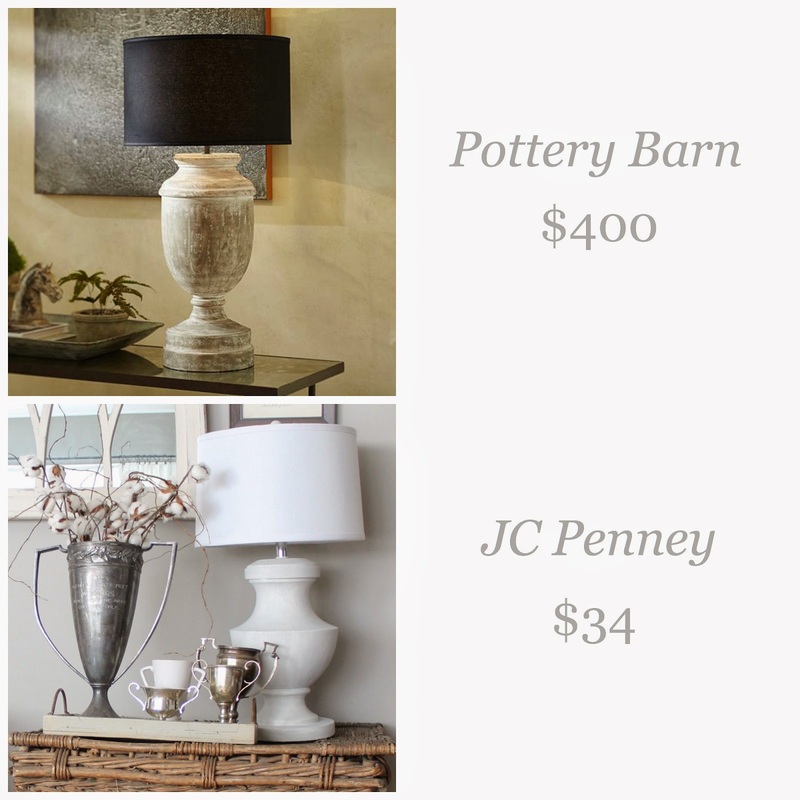 The table lamp below was just $34 on clearance from JC Penney, as opposed to a very similar $400 lamp from PB. 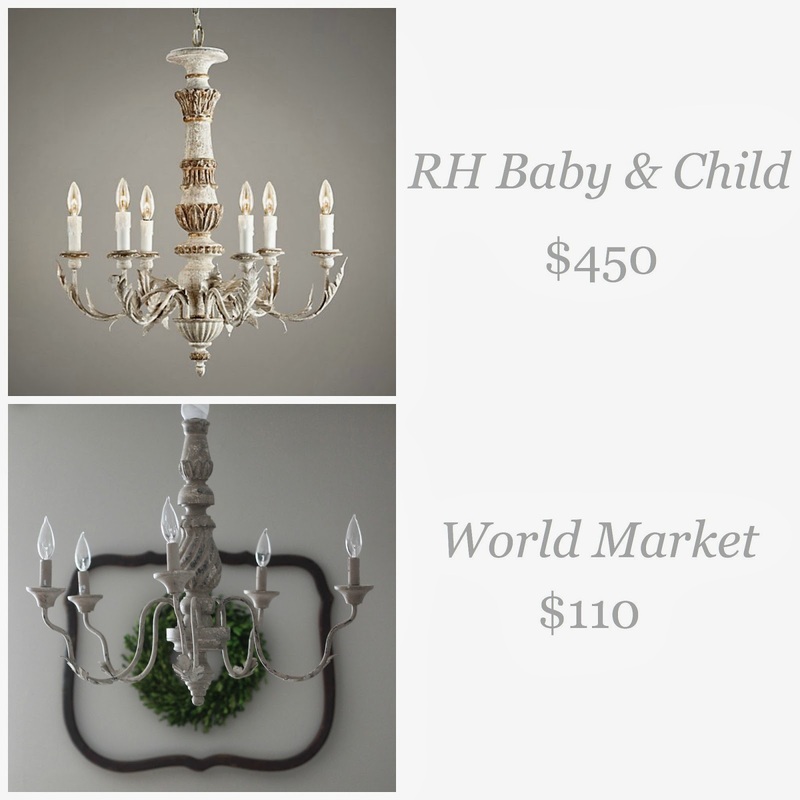 And while my dream chandelier was out of reach at $650, I still achieved an elegant French look by purchasing World Market's vintage-style chandelier during a sale for $110. Another of my favorite sources that I don't hear much about in the blog world is Home Decorators Collection. 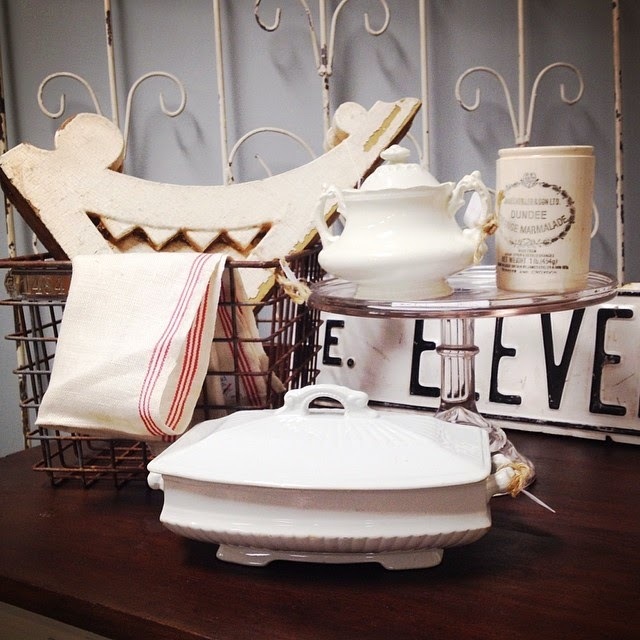 I've been able to find so many gorgeous items at incredible prices. They seem to be priced lower in general, but they also have constant sales and promotions, so I've never paid full price for anything. I absolutely love the parsons chairs I purchased for the ends of our dining table. They are custom upholstered when you order and the quality is beautiful. Our bricklayer coffee table is also from Home Decorators and it gives such a high-end look to the living room. 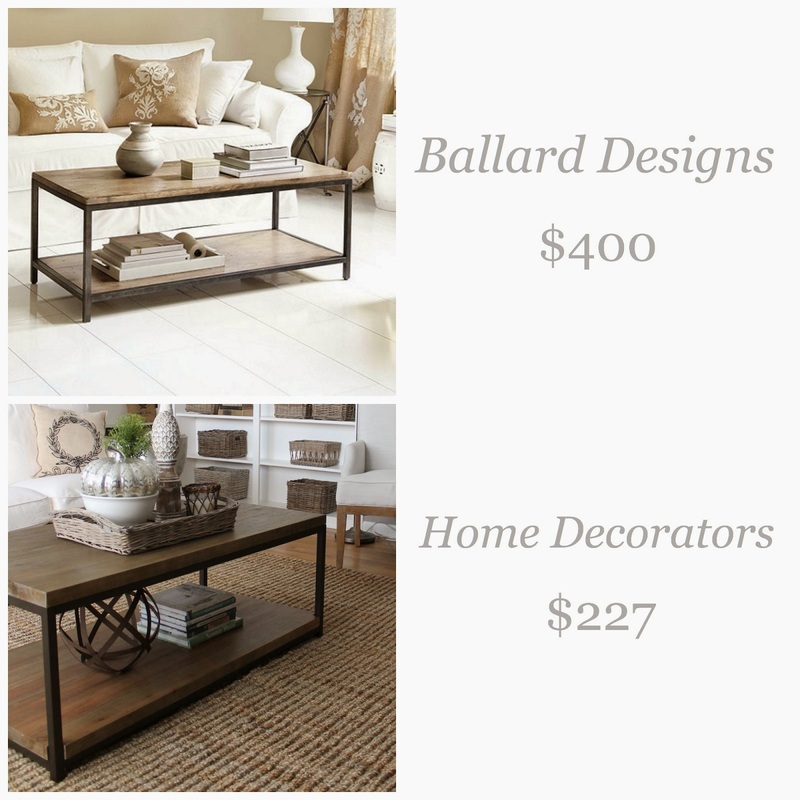 I love Pottery Barn, Ballard and Restoration Hardware just as much as the next person, and do own several pieces from them. There is certainly nothing wrong with that. 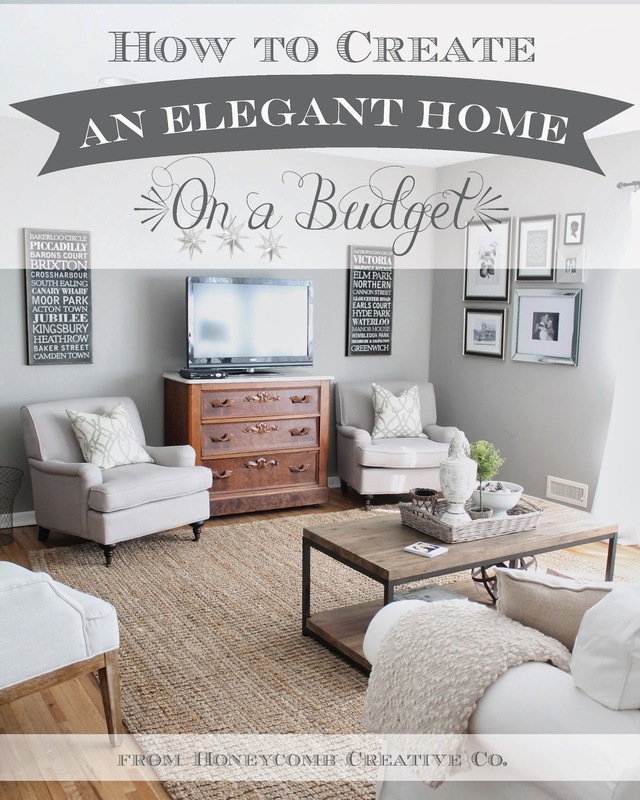 But it seems most people are on a budget that doesn't always include high-end furnishings. Hopefully our house proves you don't have to spend thousands upon thousands to achieve a high-end, elegant home. My husband is a teacher and I work for a church. We are far from wealthy. But having a beautiful home is important to us, so shopping around and getting off the beaten path is a must when buying furnishings. Hopefully this helps inspire you to do the same! Two and a half years ago, I became an antiques dealer. I didn't really mean to, I guess, it just sort of happened. 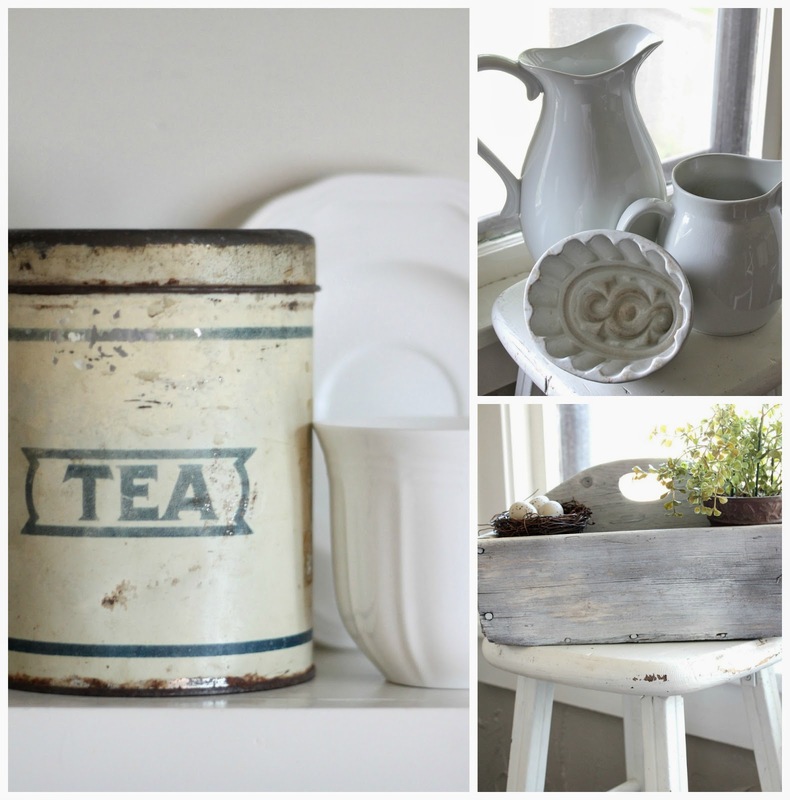 I was following lots of blogs, and realized I loved the ones with vintage style to them. 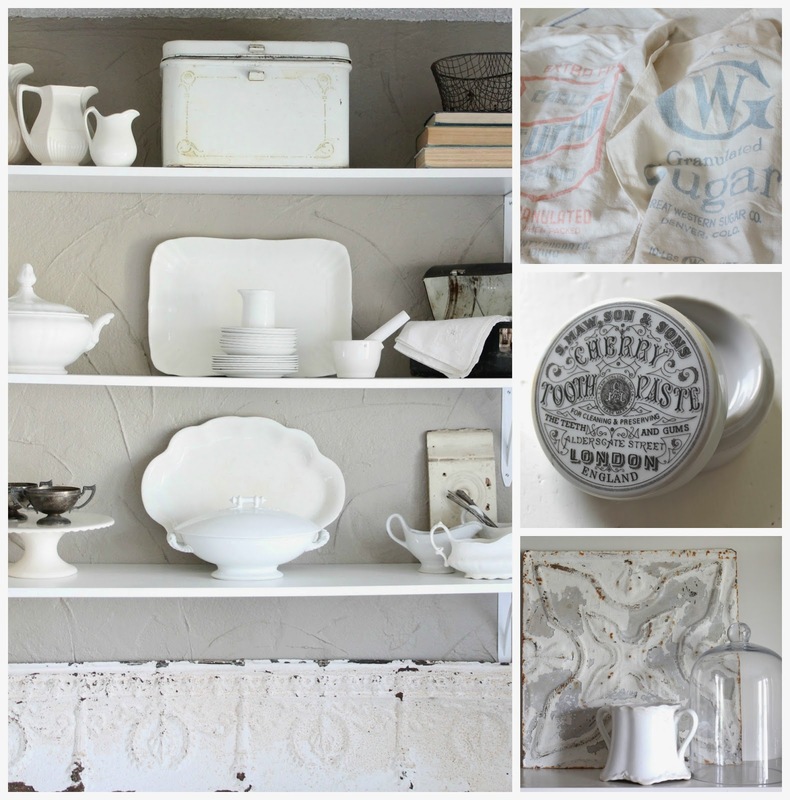 The bloggers were talking about going to flea markets and collecting something called ironstone and using words like "chippy" and I sort of fell in love with all of it. 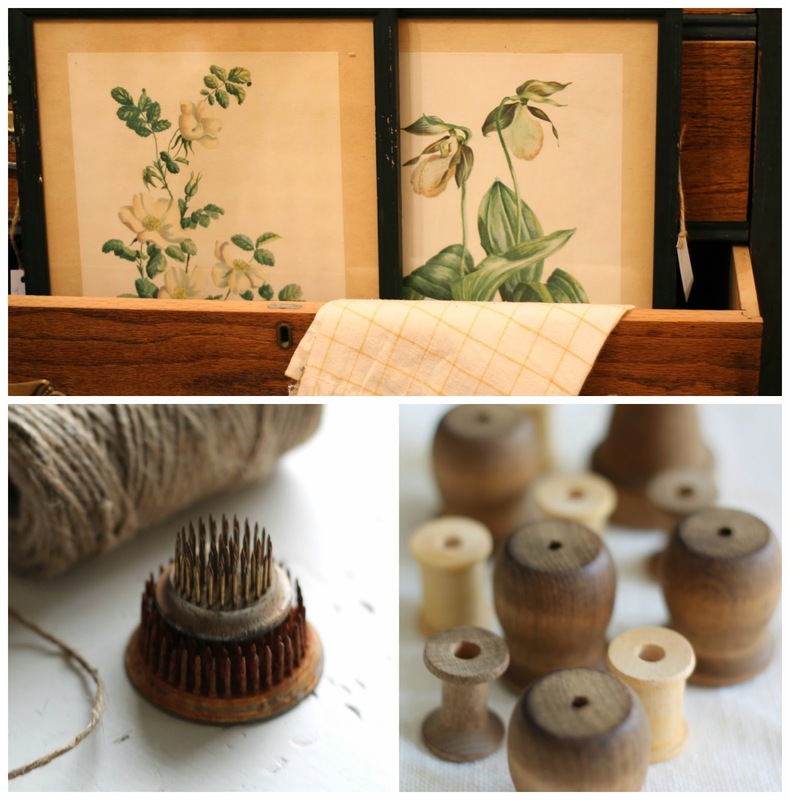 I noticed most of the bloggers I loved had an etsy shop where they sold vintage finds. That was so cool, I thought. And I thought I could do it too. So I started going to antique malls and flea markets and estate sales - things I'd not really done before. 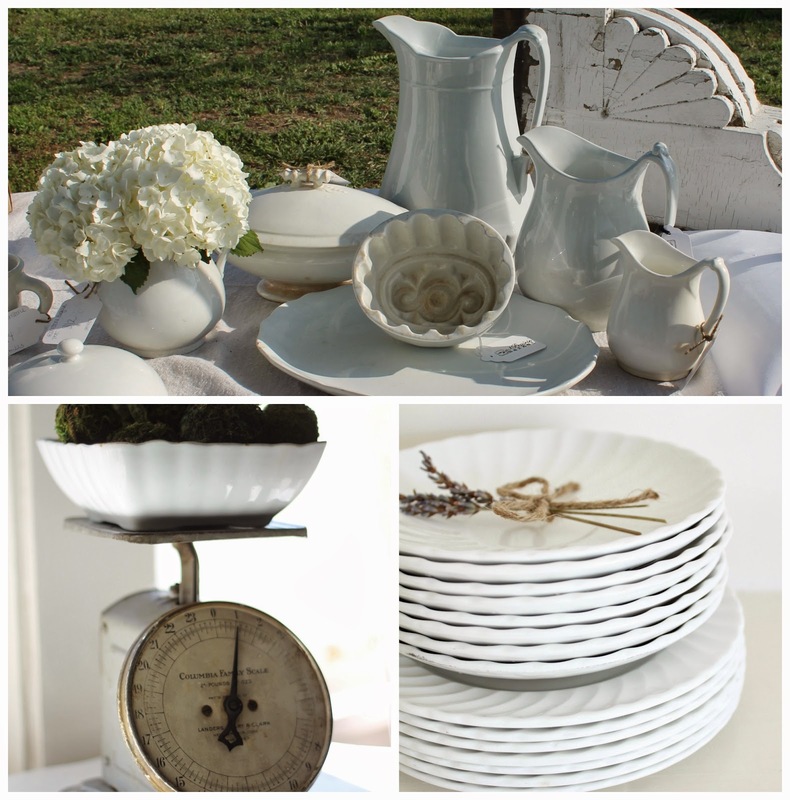 I started learning the difference between ironstone and china, what items had the best patina, and how to spot an awesome score in a sea of total crap. It was a blast! I loved every minute! After starting my etsy shop, I had a little garage sale. That's where I saw a girl named Abbe who I knew painted furniture and liked old stuff like me. I took a chance and sent her a facebook message to see if she ever needed some pretty old things like I sold. We talked. She told me she wanted to start a store. A real brick and mortar store. At that moment my dreams came true! In March of 2012 The Cottage Collective opened its doors. It was amazing. People lined up outside just to buy the old stuff I loved so much. And for two years now, I've spent countless hours buying and selling, hunting and gathering, roadtripping, scavenging and pricing. It is so wonderful. And...it is so much work. The good kind, the fun kind, but still a lot of work. I've also noticed something over these two years. Everyone else started to think vintage was pretty cool too. I used to find all sorts of great things at cheap prices, then resell them for a good price. But I've noticed it's becoming harder and harder to find "good vintage" at a price I can turn. I think everyone else is after it too! So I've had to rethink some things. I still love vintage. I still love buying and selling. But maybe the little shop I loved so much wasn't the right place for me anymore. It's been such a magical experience the last two years, but it might be time for a change. So, this month will be my last month at The Cottage. I'm so sad to see that chapter close, but also so excited to see what the future holds. I'm not entirely sure what that will look like just yet, but I do have some dreams. I think I'd like to continue selling, but at my own pace and in my own way. That might include re-opening my etsy shop. And I'm also doing some dreaming about a once-a-year tag sale right in my very own backyard. We shall see. I'm not entirely sure what's next, but I know it will be a wonderful journey. Because the thing about being an antiques dealer is...it's kinda become a part of who I am. So no matter the form it takes, I'm just glad to be a part of this unique unique niche that is vintage and antiques! I'll be sure to keep you posted on what's next! Thanks for following this little journey!